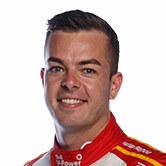 Scott McLaughlin has continued to fire at Phillip Island, set to start today’s 200km from ARMOR ALL Pole Position. Red Bull star Jamie Whincup was lucky to slot into P2, 0.07sec behind McLaughlin’s 1min30.7018 after finding himself in the kitty litter off turn two early in the session. There was concern he may trigger the red flag and tumble to the back of the field, but his fast lap later catapulted him from P25 to P1 midway through the session, before the Volvo powered through to take the top spot. Whincup explained both front-runners were strong at different parts of the circuit, but was hopeful they could challenge the S60 in today’s race. McLaughlin felt he may not have the edge today, but was able to clinch the pole on his final run. It was a good showing for his teammate James Moffat who ended the session fifth. Mark Winterbottom and Fabian Coulthard start on the second row, with Shane van Gisbergen alongside the #34 Volvo. Nick Percat’s LDM Commodore spent some time in the garage with a power steering issue and will start from 26th. The V8 Supercars 200km race kicks off at 2.10pm local time.